For Undergraduate Research Week, we’re featuring interviews with our senior honors thesis students about their work in progress. What encouraged you to get involved in research? To be honest, I felt like it was the natural progression of my undergraduate career. I had taken a grad level research course with Dr. Ernst of religious studies in the past and loved it, and I’ve always enjoyed (weirdly enough?) writing papers and doing research. 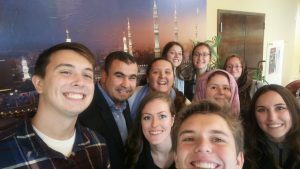 I am genuinely and enthusiastically passionate about the topic of my research, and my initial research questions about Jordanian identity were actually questions that I left Jordan wondering about after studying there in the summer of 2018. It’s been really rewarding to get to dive deeply into complex questions I truly want to explore. What is the most valuable lesson you’ve learned from this experience (so far)? Developing an effective methodology is key, even when one’s research is not exactly empirical. You must be able to make sense of your notes on your sources and be consistent in the way you relay and produce knowledge for your readers! What has been the most difficult part of your research experience (so far)? As someone who is very “deadline motivated,” I find it difficult to stay consistent in the volume of work I’m doing on my thesis day to day and week to week. Keeping on track is key to completing the project, but it’s its own challenge! What do you want to do as a career, and do you think you might want a career that involves research? Though I plan first to go into NGO and nonprofit work, I would like to envision a career in academia later down the line. I love the university environment and could definitely see myself returning to teach and do research later in life. University of North Carolina at Chapel Hill alumna Olivia Holder will join the fourth cohort at the Yenching Academy of Peking University in Beijing, China, as a Yenching scholar. A Yenching Academy scholarship offers a fully funded interdisciplinary master’s degree in China studies. Holder will enter the program in fall 2018 with a concentration in history and archeology. She is Carolina’s first Yenching scholar. Hanna Sprintzik’s talk on her personal and professional journey, sponsored by the Carolina Center for Jewish Studies, can be seen at this link. On April 18, Peter Cooke, a major in Arab Cultures, was awarded the Algernon Sydney Sullivan Award, one of two prestigious Chancellor’s Awards honoring humanitarian work by undergraduates each year. 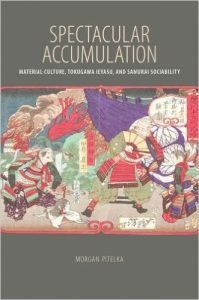 The Southeast Conference of the Association for Asian Studies (SECAAS) awarded two book prizes for 2016, announcing these at the SECAAS annual meeting, January 13-15, 2017 in Oxford, MS. Morgan Pitelka, Professor of Asian Studies and Director of the Carolina Asia Center, won one of these awards for his book, Spectacular Accumulation: Material Culture, Tokugawa Ieyasu, and Samurai Sociability (University of Hawaii Press). On February 20, Dr. Yaghoobi organized a book reading for Dr. Mateo Mohammad Farzaneh (Northeastern Illinois University) who discussed his book The Iranian Constitutional Revolution and the Clerical Leadership of Khurasani (Syracuse University Press, 2015), and the role of Islamic jurisprudence and political reform in Iran. Dr. Yaghoobi also organized a panel on the topic of the Iran-Iraq (1980-1988) war. Dr. Mateo Mohammad Farzaneh (Northeastern Illinois University) and Dr. Amir Khadem (University of Alberta) were featured scholars who spoke on the war and its aftermath. Dr. Fadi Bardawil recently published an essay on the Metropolitan Left’s abandonment of the Syrian struggle for emancipation in the Syrian electronic magazine, aljumhuriyya. Read it here. Arabic lecturer Khalid Shahu took students to Apex Mosque to learn about Muslim culture. Read about it in the Daily Tar Heel.